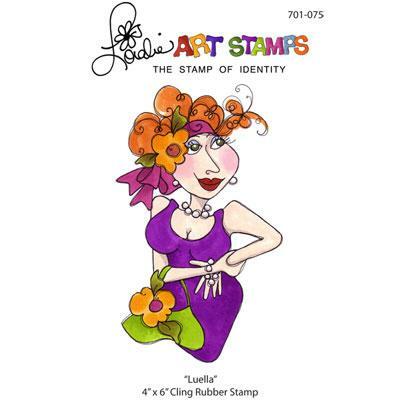 As I mentioned in my last blog, I am now stocking Loralie Designs Art Stamps on my web site. As I will be taking them to the shows as well I thought I had better try to get the hang of the stamping business. 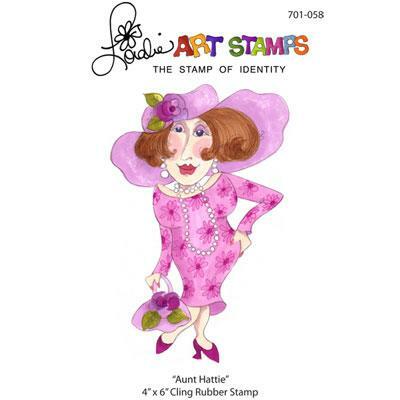 Before we start all you seasoned stampers out there can either go and look at another site or prepare to be amused. I have never done this before and I think it might be a bit of a steep learning curve. However, I did these the day my stamp pad arrived so hopefully it can only get better. 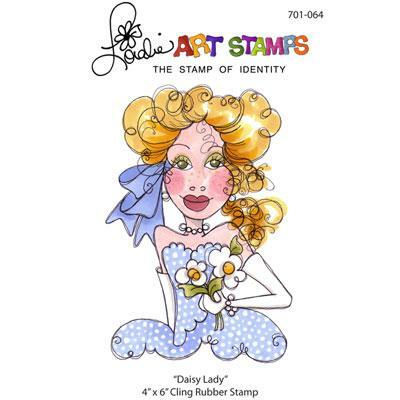 The first thing I realised when I received my consignment of stamps from Loralie is that the picture on the packet does not have to be the finished project. The fun bit is using different colours to create different looks. That is what this blog is about, albeit in a limited way. 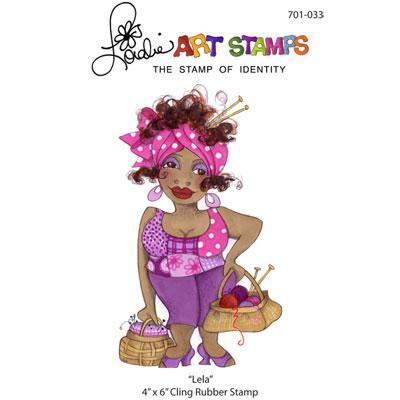 The stamp I decided to use was Lela. 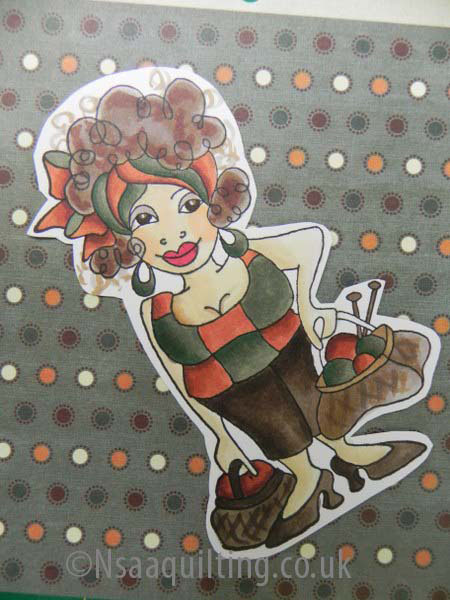 Here is Lela as Loralie coloured her. 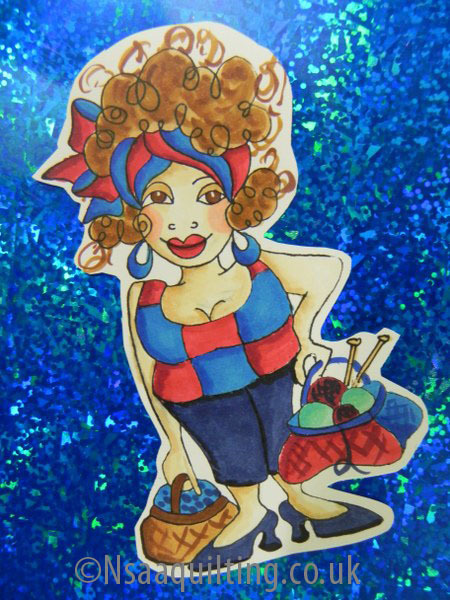 She is very colourful but I decided to see what she would look like in a different colour. First I took the stamp, block and pad. 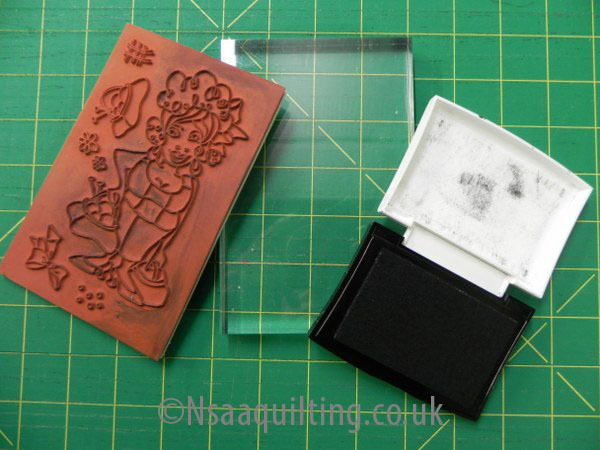 The first thing I learned was that a cling stamp needs a block to which to be attached during the stamping process. The stamp sits on top of the block and grips it. It doesn’t need to be stuck on. 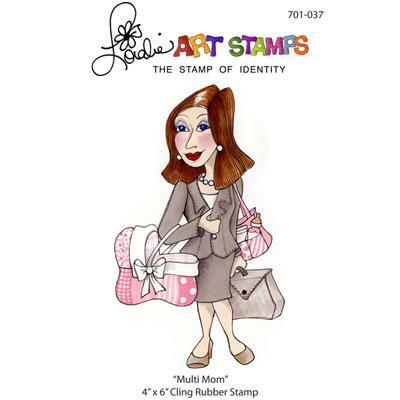 This of course has the advantage that you only need one block for your whole collection of stamps. Mine is A6 which is exactly the size of the Loralie Stamps. It would also serve for smaller stamps. When I was looking at buying ink pads I assumed that I would have to buy one as big as the stamp. This proved to be erroneous. As long as the pad has a hinged lid to allow it to fold behind the stamp then any size will do. I have read that the very small ones are not such a good idea but, not having used one I couldn’t comment. What you do is have the stamp facing upwards and ‘pounce’ the ink onto it. There are numerous Youtube tutorials on this if you want the details. In fact Youtube is a fount of knowledge. Some people maybe shouldn’t be doing them but you can watch them all and decide who knows what they are doing and who doesn’t. 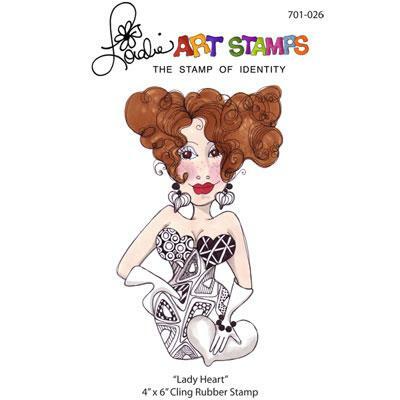 The next process is to get the stamp stamped onto your card. I tried it on some card I use in my printer and it was perfectly OK. However I decided in the interest of research to try the special paper sold by Copic as I was going to use their markers. I must admit that the image was brighter and clearer when coloured in but it depends what you are aiming at really. Anyway, It took me a few goes to get a crisp image but as I have no trouble since I can only assume that the stamp needs a bit of conditioning. So don’t be put off if the first few images are a bit hit and miss. This is what I produce now, still not perfect but not bad. Ignore the accessories round the edges. 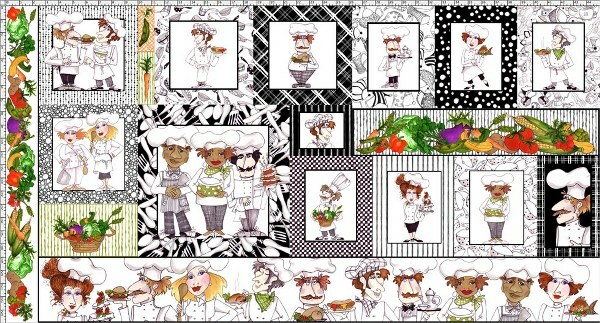 They are not part of the image I am using so were only inked as a bi-product and therefore are not crisp. 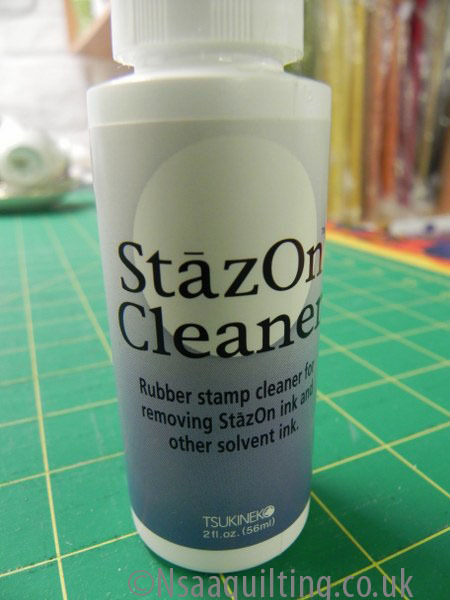 At this point, if I have finished with the stamp I use stamp cleaner to keep it in good condition. After all I may decide to use a different coloured ink and I wouldn’t want the black to take over. This is the one I got but there are lots out there. Someone suggested soap and water but I am here to tell you it didn’t work with my ink. I then got to the interesting bit. 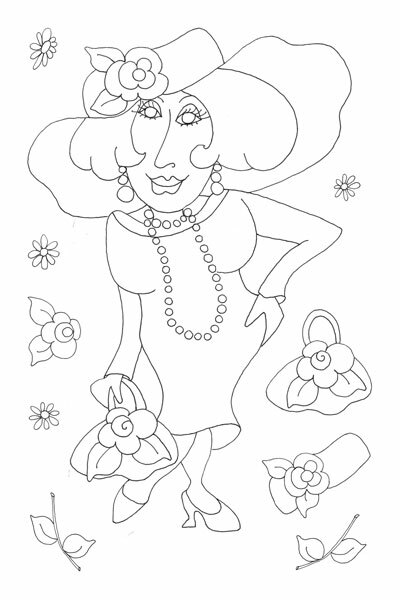 Word of warning – if you have to be somewhere do not start colouring. Time develops winged feet and disappears out of a window somewhere. I treated myself to some Copic Ciao markers. They can be bought in sets but if you can’t afford to spend a lot at one go try buying them in smaller groups. There are groups of colours that go together to assist shading etc. There are Youtube and blog lessons from Copic representatives telling you how the numbering system works. The best way to start would be to buy the flesh colours and then a group of whatever is your favourite colour. 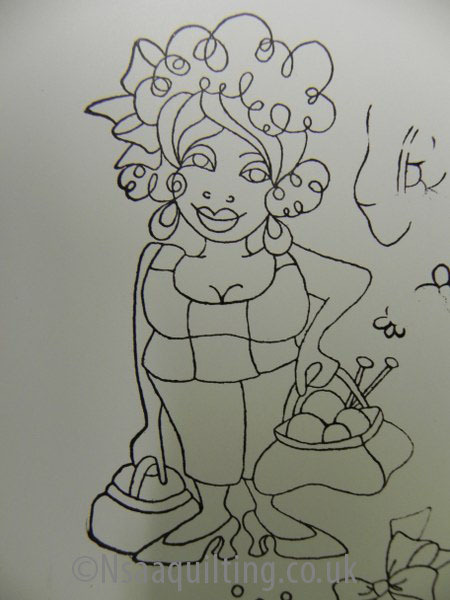 This way you are less likely to get frustrated because you can’t do the shading just as you would like. Anyway, I could never resist colour and I have learned over the years that if I don’t have what I need for a project I become frustrated so I have all of them. 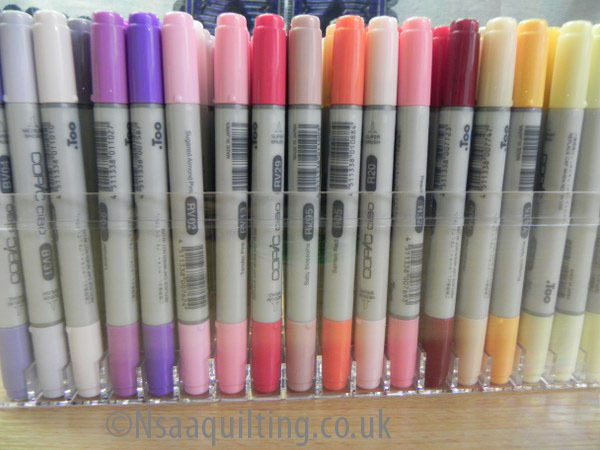 The frustrating bit is that I later discovered that if you are really serious they have other ranges in more colours. This is however only a problem if you are trying to follow instructions for shading in one of their instruction books. Anyway, this is how they come. This is a mixture of two boxes as I rearranged the lot into number order to make life easier. When I came to colour the image I was a little irritated as I had carefully researched which ink to get. Despite this some of the ink ran when it came into contact with the markers. I have tried using a hair dryer and leaving the images overnight but if that doesn’t work I guess I will have to do some trial and error tests. The first colour scheme I tried was blue and red. I was quite pleased with the result. I am not there with the flesh colour shading but I haven’t yet found the right combination of shades. However, you get the idea. Then I bought some paper and decided to try to match the colours to it. Unfortunately the background doesn’t show up in its real colours but again, you get the idea. What it does show is that one stamp can look really different in different colourways. Next I am going to experiment with flesh colours and try the darker ones too. I read one blog where someone had , presumably stamped out the clothes onto patterned cardstock or paper and used that for the clothes. This, of course meant that it could be made to match exactly the surrounding card. I am sure lots of people are saying ‘so what’ but it’s like everything else, if you have never done something before there are lots of eureka moments along the way. You have just forgotten yours. I expect in time I would forget mine if I became proficient. Bye the way, the title is a bit misleading as, as you can see below Loralie does not always even supply feet, let alone stamp them. Here are a few of the other stamps. 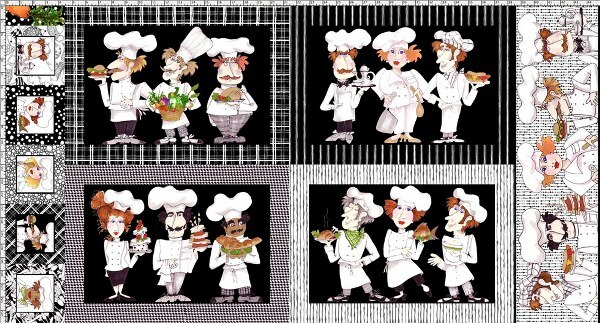 If you want to see more go over to my web site and see the range. There will be more soon so keep looking. Now to stop this becoming another hobby. 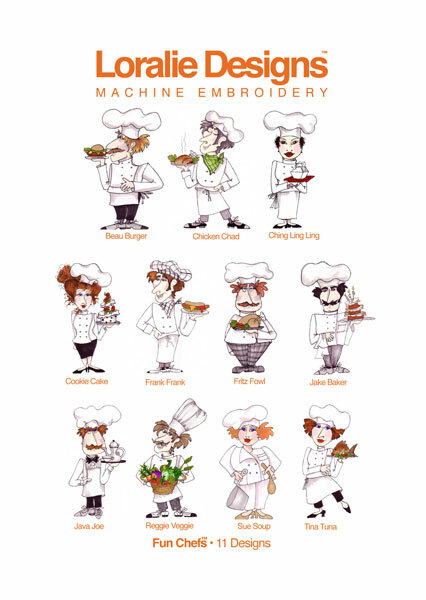 The sole purpose of the purchase of my embroidery machine was to stitch Loralie Designs’ quirky characters. 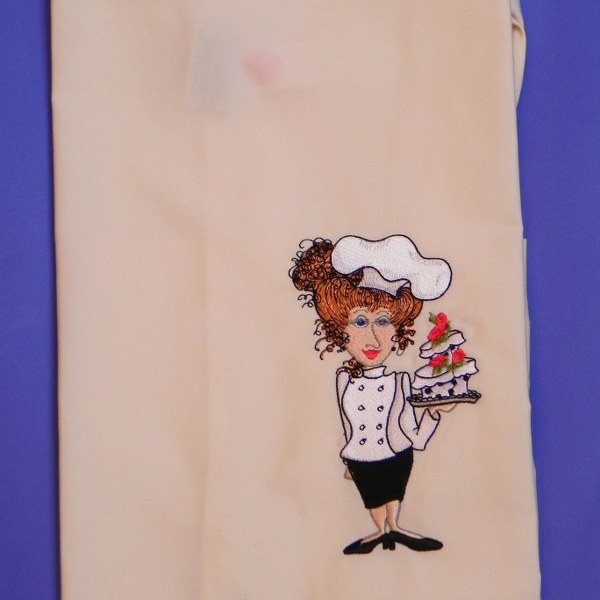 One of the first CDs I bought was for embroidering onto aprons and it was the Fun Chefs collection. By popular request Loralie has redesigned the matching fabrics and as I was asked for them at the last show I now have them on the website. 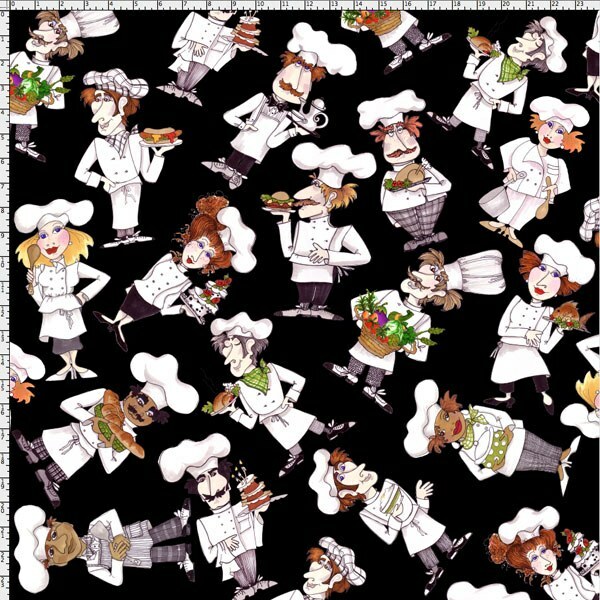 There is a tossed fabric in black and also white which would be ideal for making aprons for instance. The figures are quite large and therefore have a presence. There is, of course a panel. 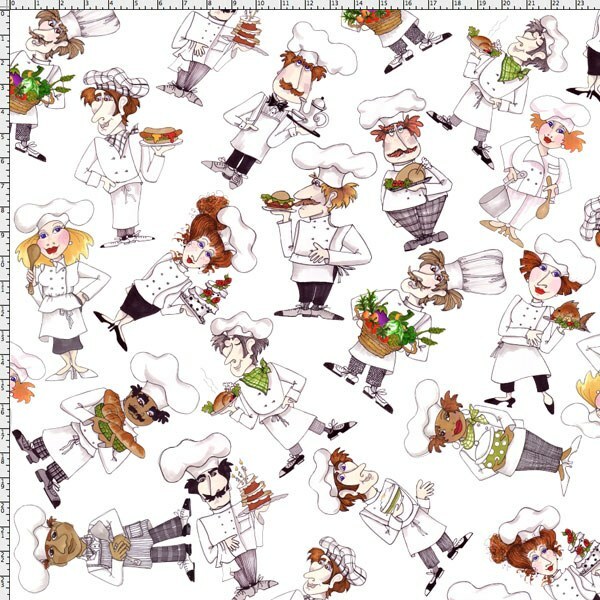 As an extra she has also designed a place mat panel. The first sale was winging its way to France the day after I put it on the site. How appropriate. In case you are wondering what I have been doing in the dungeons of late, I have been adding to my animal collection. 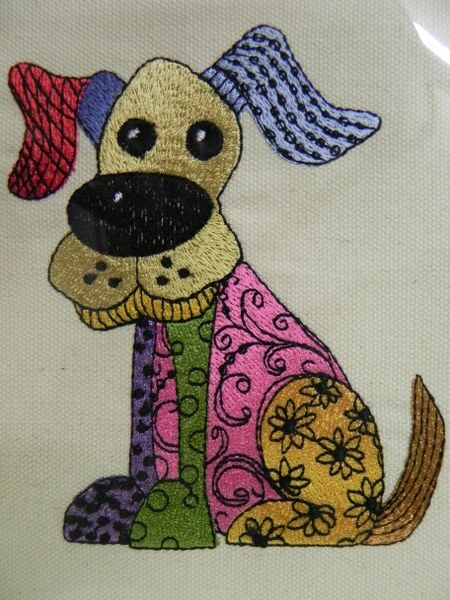 First of all I did some embroideries to match the Dog Happy collection. I did the whole CD’s worth but I will not bore you with them all. 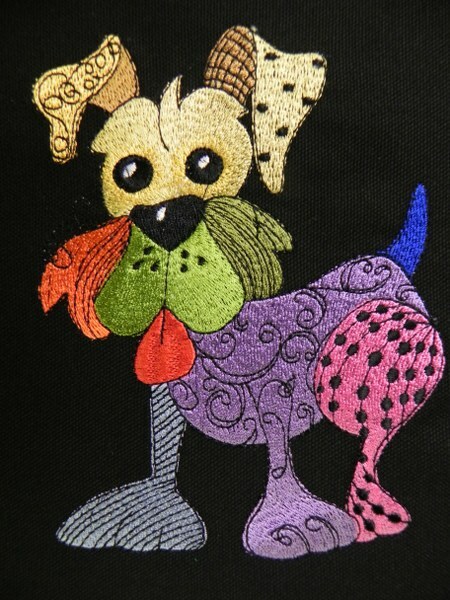 Then I made a couple of things with the Dog Happy and Cool Cats fabrics. Another of my sample bags. 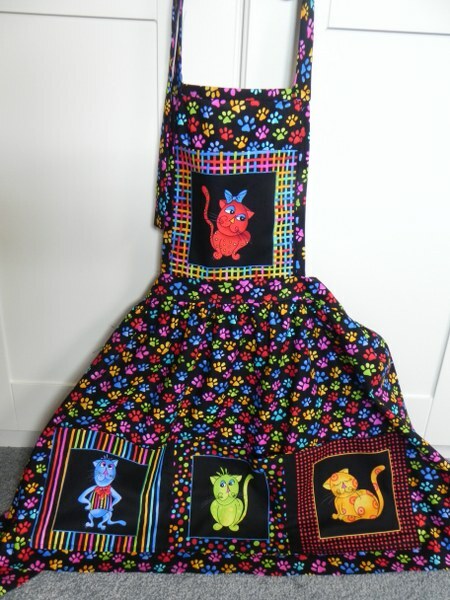 Then a pinafore for the serious cat lover. I don’t know about you but I love the bright colours on black. I could, however be in a minority. I think a lot of people are afraid of colour. It may just be that they are afraid they won’t like the final result and fabric is expensive. Whatever the reason, remember everyone is entitled to their own taste and none is superior. Speaking of expensive fabric – have you noticed the trend for racking up the price of fabric just because it has gone out of print? 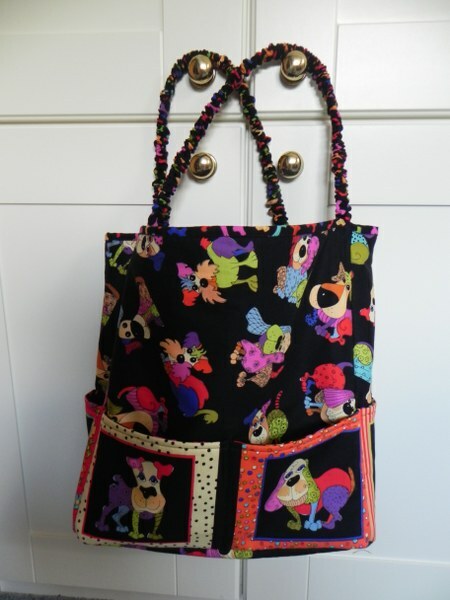 I saw someone the other day had tripled the original price of a Loralie Designs panel because they said it was rare. Add postage to that and it was 5 times the price. You really would need to have it for that amount. Maybe I’m just a cheapskate. That’s my rant for the day so I guess it’s back to the dungeon. 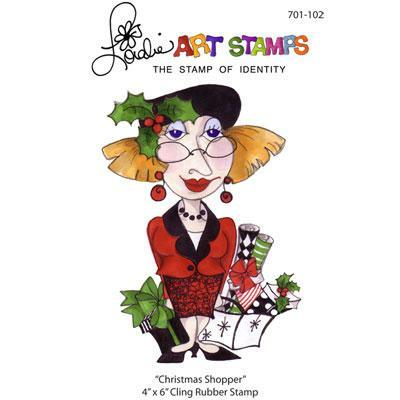 Before I go though I will be getting some of the Loralie Art stamps in the next week or so so watch this space. 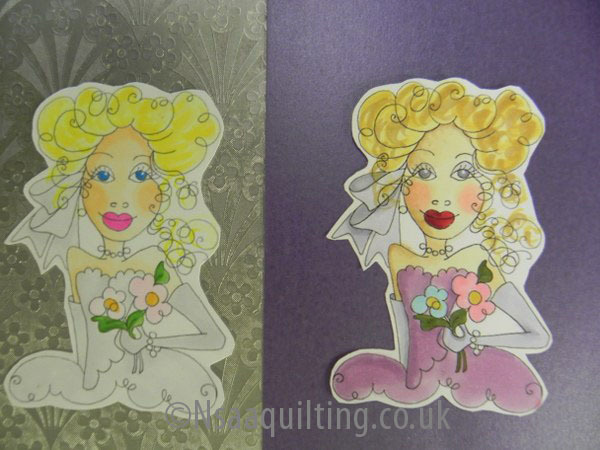 They are good for cards etc but also for colouring fabric to look like water colour pictures. The actual stamp gives you this. The Clearing at the end of the Fancy Forest. Sea Glass of a Different Hue. Click to Visit My Shop. - 'The Stash: A random collection of fabric scraps collected by the avid quilter against future projects and in the hope of being inspired. - Fat Quarters: A half metre length cut into two pieces each half a metre length by half the bolt width. - Stitch in the Ditch: quilting through all layers with a straight stitch in the groove formed by a seam. The stitching is hidden by the seam. 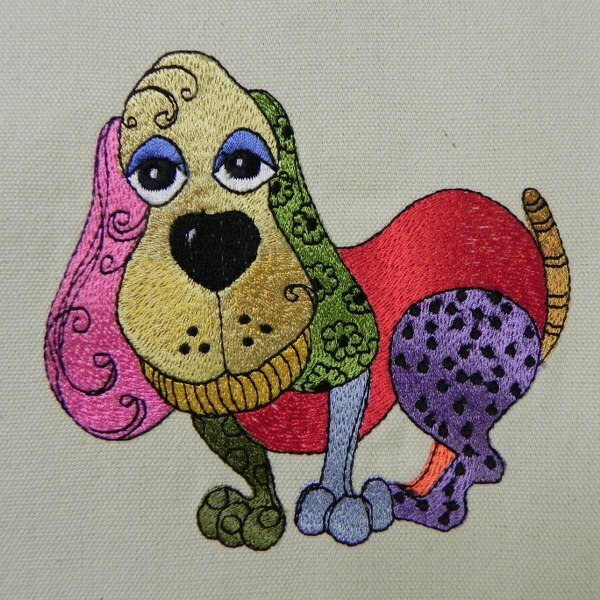 - Fusible Webbing: Paper with heat activated glue on one side for attaching applique pieces to background fabric. 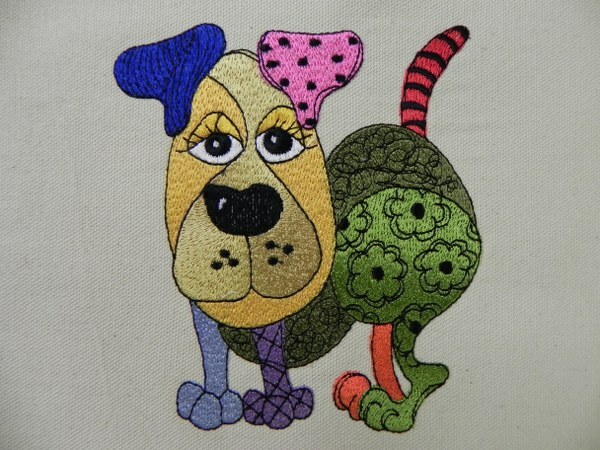 - Applique: fabric shapes fixed onto quilts etc with stitching. - BOM: Block of the Month. Project supplied in monthly installments. - UFOs: Unfinished Objects. All things started but never quite finished. 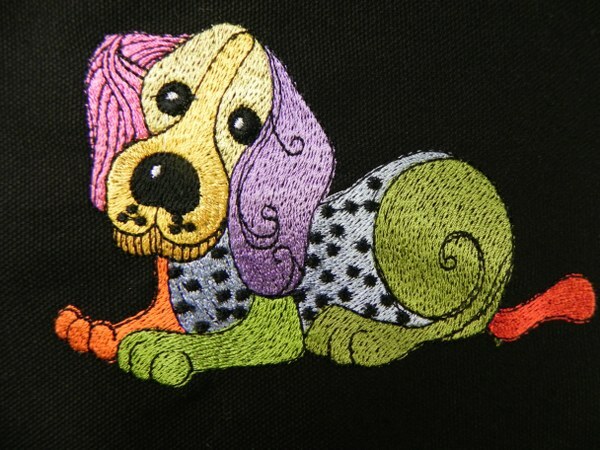 -Satin Stitch: This is a zigzag stitch with a very short stitch length used for attaching appliques. -Sashing: The thin strips of fabric used between blocks on a quilt.